These interpretations of the three covers are based on a MS I.33 seminar presented by Scott Brown. If I am understanding Mr. Brown correctly, the drawings in I.33 use what is known as flat perspective. 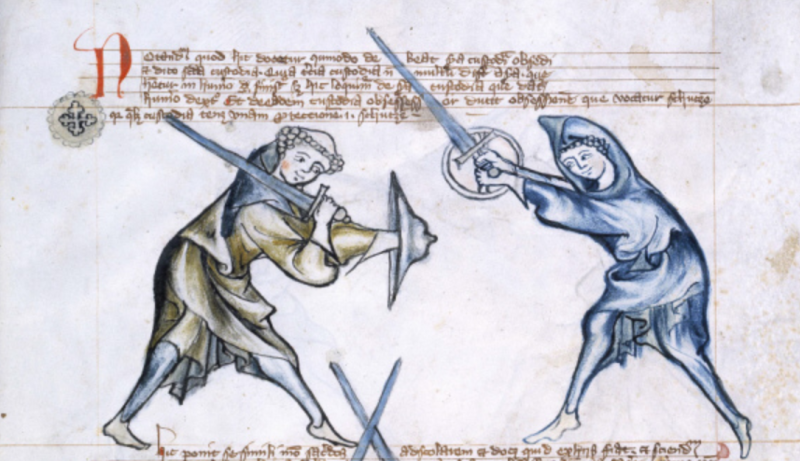 What this means in real terms is that the buckler are sometimes shown at the wrong angle so that you can better see the relationship between the hands. I think of this as more of a technical drawing (e.g. a subway map) than a literal representation of what is happening. An easy way to understand this is to look at the size of the bucklers. The priest’s buckler appears to be twice as big as the scholar’s buckler. 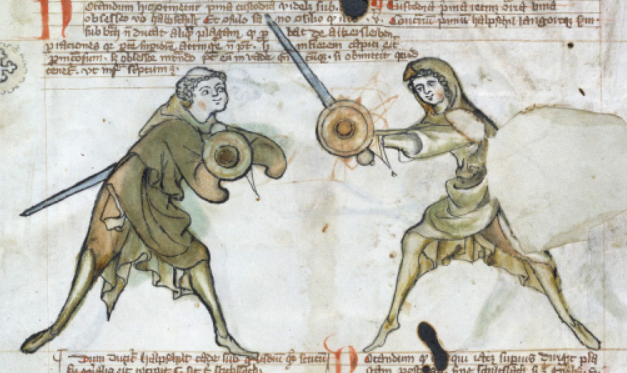 Here the artist is trying to convey that an outstretched bucker seems to be larger because it offers more protection. And if the scholar were to measure the priest’s bucker in degrees relative to his viewpoint, the closer bucker would in fact be larger. If the priest (left) attacks low, the scholar will use his reach to attack high. The best he can hope for is a double-kill, which even in a friendly tournament should be avoided. 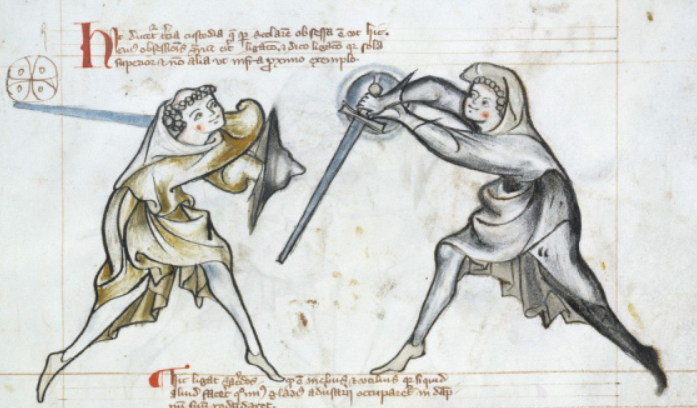 If the priest attacks high from his left towards the hands, the scholar catch it on the buckler and cuts to the head. 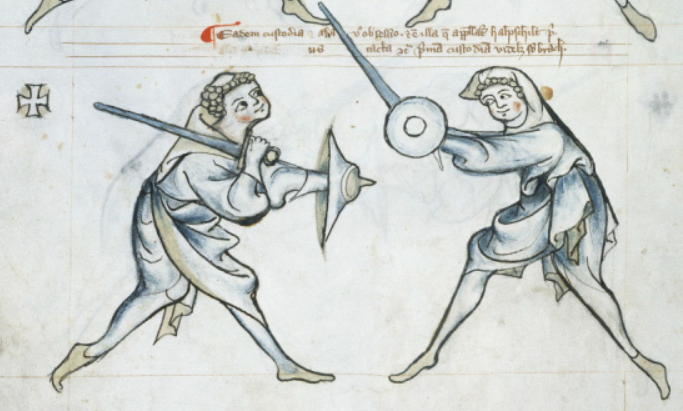 If the priest attacks high from his right, a somewhat difficult move, the scholar catch it on his buckler and cuts to the head. If the priest does nothing, the scholar drops the point and thrusts to the face. The one option the priest really has is to attack the sword from his left and drive it down. This is explained in the first play of MS I.33 along with the scholar’s counter to that. Note: MS I.33 is meant to be an advanced level text. The reader is assumed to already know all of the basic attacks and responses when faced with first ward vs. half-shield. So spend a lot of time researching them first so that you have a foundation to work from. This is used to attack those in Second Ward. According to Scott Brown, the image in I.33 shouldn’t be taken literally. In second cover the buckler should be facing more forward than right, but was drown this way to better show both hands relative to each other. In the case of second cover versus second ward, the fencer in second cover would have his bucker more or less forward. 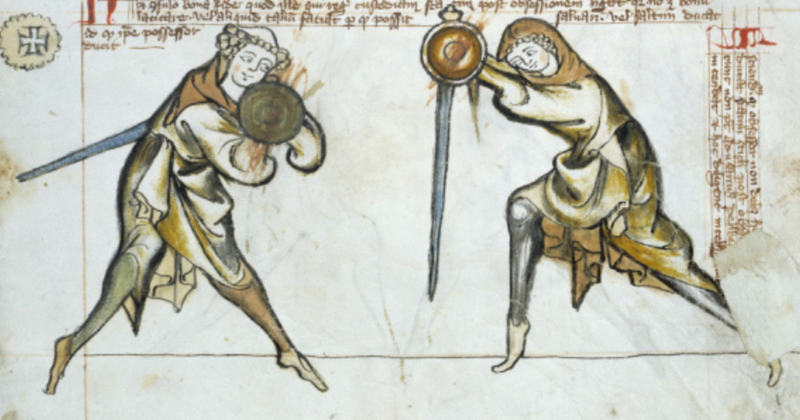 The pommel would cross the wrist, as this prevents the other fencers from simply batting it away. To ensure your interpretation is correct, make sure you can defend yourself from attacks along all four lines. It is more important for these covers to be effective with your body mechanics then it is to try to exactly match the pictures. Like second cover, the buckler should be turned forward a bit compared to the drawing. This is needed because the fencer in third ward can attack to either high line. I seem to remember that Scott taught this with the buckler hand thumb up, but the picture clearly shows it down. I’m not sure if I’m mis-remembering this or if it is another one of those “it depends” situations. Krucke is the fourth cover in the MS I.33 system. It is like third cover expect that the wrists are not crossed and the buckler is on the left. The important thing about the covers is that they are all relative to the threat. They are going to move up and down, side to side, and rotate depending on where the threat is.